The Myki Mates (or Myki Mutes, as on seasoned observer called them, given their reluctance to talk to anybody just yet; perhaps they’ve been ordered to not speak unless spoken to) are out and about at CBD stations. All the machines have been turned on, which means those of us who were mischieviously holding up multiple Myki or Short Term tickets to the scanners to get them to wake up (and say “Multiple cards presented!”) can now stop doing so. As-of Wednesday, a thousand public servants have started using it as part of the final testing phase. They’re meant to be detailing their experiences to the TTA. Whether it means any major changes will be made is unknown as yet, but given the repeated promises the system would be public by the end of the year, I’d assume not. Continual rumours are that (if everything goes smoothly) the system could be switched-on for the public on November 15th. Who knows if this is true. And I must say, despite the delays, despite that I still think the money would have been better spent elsewhere, and that I think it has its faults, now that it’s almost here, I am kinda looking forward to it, because it does actually bring benefits. Whether these are all worth the huge price tag is another matter, of course, but even I’m a little taken aback by the sheer amount of doom and gloom around it. The scanner speed needs to improve. A month ago I found Bendigo buses were taking 2-3 seconds per scan. There has been a software update since this, but it’s not yet clear if the response time has been cut. Anyway, we’ll see how it goes in the next week or two. And when they switch it all on, I plan to be ready. The Age got a bunch of information from the TTA and distilled it into an FAQ in today’s paper. It was pretty good, but I think some of it fell victim to the TTA’s spin cycle, and here I humbly offer some comment on the answers that were provided. What if I decide I do not want myki once I have bought it? You can cancel it, but it will cost $9.80. Alternately you could use up the balance, then chuck it away; then it would only be costing you the original purchase price. The $9.80 fee only applies if you want a refund on money on the card. Not if you want all the benefits offered by myki. True, but if you’re paranoid, the benefits probably aren’t compelling. An anonymous Myki is much the same as most tickets now (except more expensive) – not registered/protected against loss. What will happen to the existing system, Metcard? It will run alongside myki for at least six months, probably longer. It could theoretically remain until 2012. Assume this is the TTA’s spin talking. We already know the rollout will happen mode-by-mode, line-by-line. At some stage Metcard validators will still be around, but you won’t be able to buy a Metcard anywhere, only use the ones you already have. And those will then run out. So it’s not like it’ll still be a choice most people can make. How do you use myki? hahahaha! Now, I checked this one with the reporter. The TTA told him this. No way is it five centimetres. It’s more like five millimetres. Do I have to touch off? No, but if you do not you will be penalised – at a minimum you will pay $2.02 extra on a two-hour zone one ticket. In general if you don’t touch off, they assume you went to the end of the line (or travelled in both zones on the train system). If you were going to be paying the same anyway (eg the two-zone fare), then arguably there’s no point in touching-off. If I top up my card, will the money be added immediately? Only with cash. It will take up to 24 hours for the money to be available on your card if you top up by credit card. And if you add money via BPay, you will wait up to five days. Whoops! The Fares and Ticketing Manual says if it’s done on the system, even with a card, it’s instant. On the web, call centre etc, it may take up to 24 hours, depending on when the scanners (many of which are mobile, on trams, buses etc) get the update from the central servers to say it’s happened. A post on a discussion forum suggested updates to station machines might be every couple of hours (since they’re all hard-wired onto the system), and vehicles may get updates by wireless connection if and when they pass depots, but certainly when they go into depots (which could be as little as once-a-day). Probably similar for the handheld scanners used by V/Line conductors and bus/tram/train Authorised Officers. So, who wants to bet what happens next? Running in Melbourne in the next couple of weeks? Some fatal flaw found and embarrassing delay until after the New Year? Will it mostly work, or be a big FAIL? ← Previous Previous post: Everybody scramble! If the Myki mates are out and about, that says to me that they are very close to going public, which makes sense with the 15th prediction. All the machines are on every tram and station I’ve been to. It’s live, so they just need to give us the cards and we can start using it. 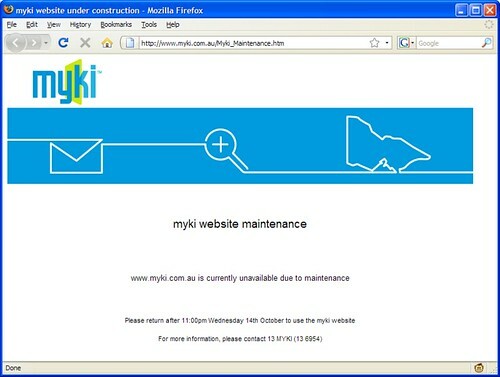 Within a couple of hours of being able to order your Myki online, the Myki website will crash because it won’t be able to cope with the demand. What happens when the Metcops scan your valid ticket, but their handheld scanner contains outdated data? Do they still harass, intimidate and fine you? Will the PTUA be up and running with the commuter club as soon as it’s live? I”m needing a yearly very soon. The idea of actually being a Myki Mate sounds awful to me. Who really wants to be the enthusiastic public face of something the public really doesn’t like? I suppose it would be an alright part-time job for a uni student considering they’re not supposed to work after 12pm or something. Which of course is making the assumption that nobody beginning their journey after mid-day is going to have any trouble with their new ticketing system. Thanks for the link to Stateline, very interesing story. Given that myki will not charge if someone touches on and then touches off at the same train station (an advantage over myki) im wondering what will be done about this rather obvious problem. What do visitors to Melbourne do? I don’t live in Melbourne anymore and for a couple of trips will not be going out of my way to buy some subsequently useless card. Just as the toll roads are designed to irritate visitors I guess this will too – so much for export dollars. My 2 cents worth – stupid people, spending too much money. mikeys, the card is the reference data. Other transactions flow to the card. 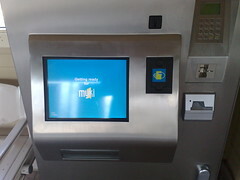 flerdle, we should know shortly how Myki will affect Commuter Club, but if you need it now, just go ahead and order. There’ll be an exchange programme for existing Yearlies. Glenn, short-term tickets (2-hour and Daily) will still be available for visitors. I saw a bus yesterday that still didn’t have Myki readers installed. 1. There will be an issue with people getting on a tram but they can’t get to a Myki reader in time because there’s not one installed on both sides of every wide door. 2. 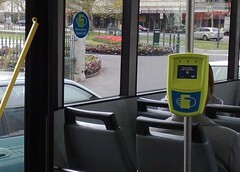 Shortly after launch there will still be a few buses or trams without myki readers. Someone will get onto one of them, and shortly after, a ticket inspector will fine them for not having a valid ticket. The inspector will say that this person should have purchased another ticket, even though their Myki has been charged already. This will be featured on talkback radio and newspapers the next day. 4. Someone will launch a test case as to whether the user has to pay a fine if the card is defective but not visibly defective. Lilydale station still has empty pedestals at the carpark end of the platform, with no card readers installed on them. I wonder how long this will go on, forcing commuters to walk the entire length of the train to validate their tickets. My request for Metcard validators at that location years ago never received a reply. I’m just going to call it Myki Mouse. @Philip, still got the reference number? Ring up and ask them again. Just about every enquiry I’ve emailed or phoned through has required a tickler to get the reply. @Daniel (Thruce’s comment) surely they could have stipulated that change of mind must be via the same card-reader within 60s? (as opposed to the Geelong situation where they did it via a different reader). @all. I’m nervous when I see they’re using .NET on the webserver, Windows CE in the card readers, and god knows in the cards. I’m kicking myself I didn’t grab a screenshot when I got a .NET error from the website a few days ago. Hi Daniel, are you able to ask the TTA about this? 13 numbers don’t work from outside Australia, (like 13myki, 131met, and 1800652313). What number should people dial from overseas (ie +613…….., or (03)……..) for each of these? Don’t let them say there’s nosuch number, coz a 13 number has to be paired to a normal landline number for it to work (unless they’re answering it in India, god forbid). have actually ridden a tram? I mean “it doesn’t work, so go and use the drivers terminal”. For 80% of peak hour its impossible to MOVE during a tram ride, much less walk up the vehicle and talk to the driver, which you are NOT ALLOWED TO DO WHILE THE TRAM IS MOVING. Hey thanks for that blurb. I’ve been quite skeptical about the ticket charge methods behind Myki, but yours is the only place I’ve been able to get a pretty damn accurate review of the positives and negatives. Great blog!